1. The process began in January of 2017 when Fr. John assembled a group of 12 members of the parish representing a diverse range of ages and demographics. The purpose was to focus our parish efforts and give a stronger direction to what we hope to accomplish in the coming years. It is a roadmap to where we hope to go, which is ultimately accomplishing the parish mission. 2. Outside help was brought in to steer the process, keeping it objective and methodical. 3. The process began with performing a demographic study of the parish, and sending out a survey to a random and diverse group of parish members, leaders, and staff members. This information was used to complete a SWOT (strengths, weakness,opportunities and threats) analysis on the parish. 4. From this base, our mission and purpose statement were re-visited and parish mission-critical goals were determined. 5. 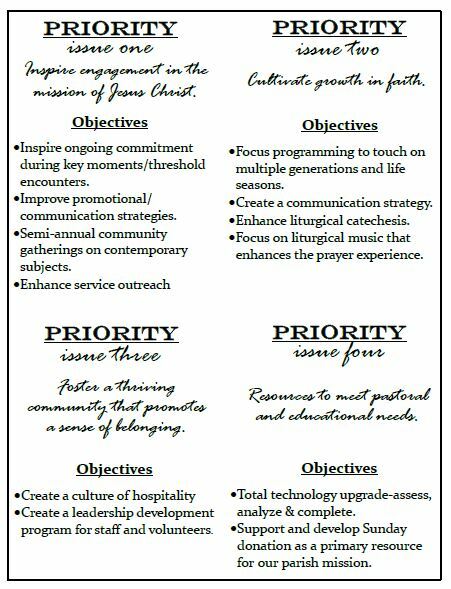 Based on our goals, parish priorities were established and objectives for reaching the goals of the parish were developed. 6. 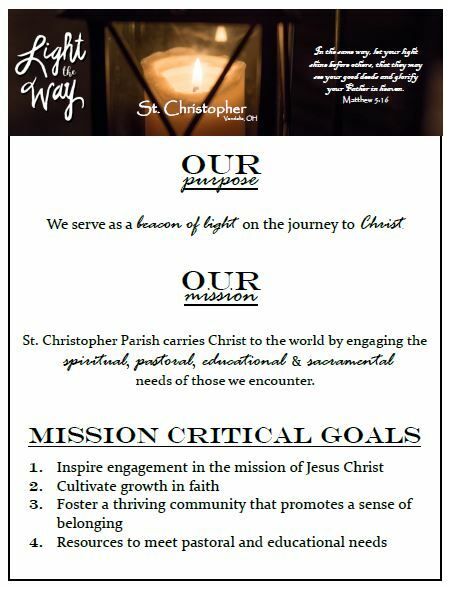 Informed by the outstanding feedback received from the parish dream postcards, the objectives were modified to reflect parish input. Overall, the parish input matched very closely the input received from the smaller samples of parishioners questioned earlier. The parish staff has read the responses carefully and they will affect future planning. We received over 400 responses! 7. Groups have taken responsibility for each of the priorities and we will meet quarterly to report on progress. Over the coming months, parishioners will receive additional information along with an open invitation to consider how you might want to become involved. This endeavor will take the efforts of the entire parish to be successful, so we will be counting on you to do your part. In the interim, please feel free to contact the parish office at bprine@stchristopheronline.com (or phone 898-3542), or email Mary Lauterbach at mlauterbach@juno.com (phone 830-2325) with questions or comments.